*Sisyphus, from the Greek Myth, was a king charged with the eternal punishment of endlessly pushing a boulder uphill, a boulder which would only, once it got to the top, roll all the way back down again. A just keep swimming mantra of old times. Albert Camus, that philosopher of the absurd, imagines Sisyphus not only content, but dare he say it, happy. A sort of middle finger to the gods who intended the task to be a punishment, a real way of getting back at upper management. I suspect the happiness had something to do with the joy of work itself, the heft and sturdiness of the endeavor—the space impossibility creates for us. This essay/long poem/meandering treatise—words rolled into a boulder which now you must roll up that long hill of attention and boredom, was (is) written [more actually performed] while the author [performer] is (was) feeling depressed, tired, and in bed. The show The Sopranos plays in the background. I have my own hill to push boulders up. You, too, I imagine. It is an attempt to stay close, to trace the outline of despair, which crawls around the subject. It was written while laying down in bed. It is despair performed—depression and language pushed up the mountain (only to roll back down). The author attempts to stay close, but these etchings and words are only traces of traces*, traces of traces you trace with your eyes, but by now, the moment of reading, I have already gone, and what is left on the page is only the absence of my own presence, and now you must confront your own absent presence (if that is, you are still reading). I feel this separation between us: You reach out, and I am only trace. I reach to you through word, and you, too, are only trace, an idea in my head, a specter of past and future reading this, perhaps, too, in bed? And just like that, the boulder rolls—rolls all the way back down the hill. So we start again. [*Derrida, that great philosopher of deconstruction gives us the idea of the trace. I’ll leave it there. It’s a bit tough to read Derrida when you are depressed. Basically, the trace is the trace of a trace—as in there are no originary marks, just traces upon traces within the trace of the trace (see what I mean? Oof.). ]. Title: A Really Long Poem in the Form of Pushing A Boulder Uphill. Alternate Title: The Boulder Rolls Back Down. How do we even begin to ask for help these days? 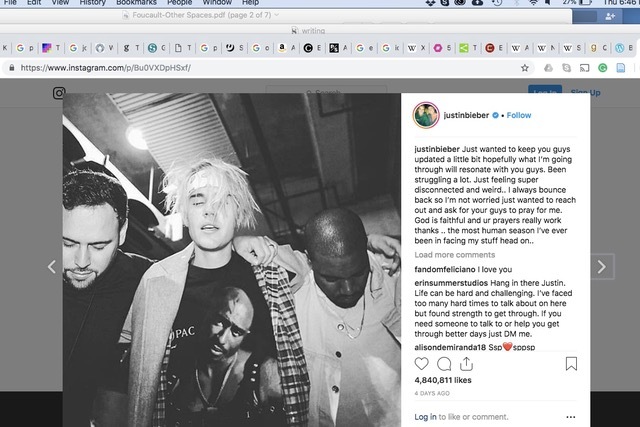 Justin Bieber posts on Instagram that he is struggling and needs help. I see it through a screen. Touching only machine my finger touches his face. Does he get help? Does he feel better? 4,840,811 people like his photo. Maybe that helps. I touch the machine again. He might already be feeling better. The trace of a trace. I scroll onward and he goes back to pushing his own boulder—uphill uphill uphill then down down down. The possibility of life is hemmed in by impossibility (this is what Sisyphus knew, how he found his work, how Camus imagines him to be happy). 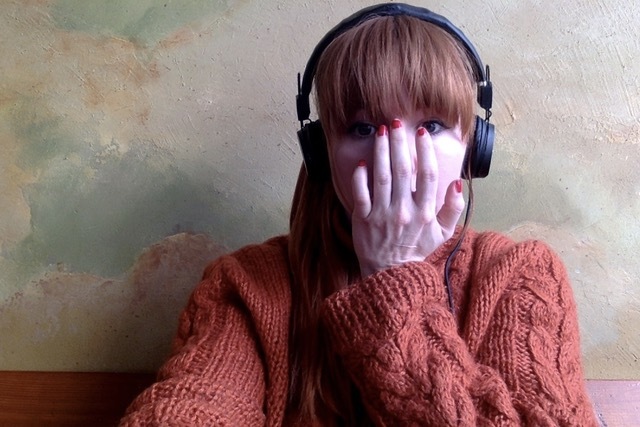 As I type this my fingers are languid—depression slows the blood—freezes the joints—ages you swiftly, swiftly enough to notice as you stare into the mirror. The thoughts arrive to the page garbled and rotten too soon. The time the words finally arrive is an arrival of a moment already past. When Hamlet proclaims “time is out of joint,” you know it is not time but yourself which is disjointed, ontologically arriving either too fast or too slow, and the bones break as it crashes into the clock, the boulder—all of which must be rolled up that hill—but you just can’t quite get the timing right, and it all rolls over on top of you. Maybe it, too, took Sisyphus awhile, awhile to get the hang of eternal punishment. All I can do is to sketch out the landscape of despair etched into the back of my eyelids, the tracks my boulder makes. I wish I could do more. The moment I almost get anywhere or tell you anything the boulder starts to roll back downhill. The landscape of darkness I observe from behind delicate, almost transparent flesh is punctuated by the blue light of screens, peeling open consciousness. They say this kind of light is not good for you. Doesn’t help you sleep. Keeps you up. Keeps you pushing boulders uphill, even in sleep. 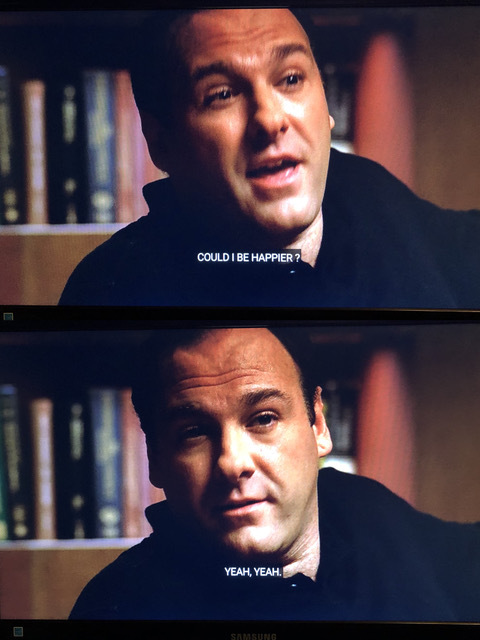 Over The Sopranos playing on a loop I fall asleep. I do not sleep well. It’s hard when the boulder gets the best of you. Right when that rock reaches the very tippy top of the mountain I wake and see it there, beside my feet, at the sinking of the very bottom. Justin Bieber asks for prayer. 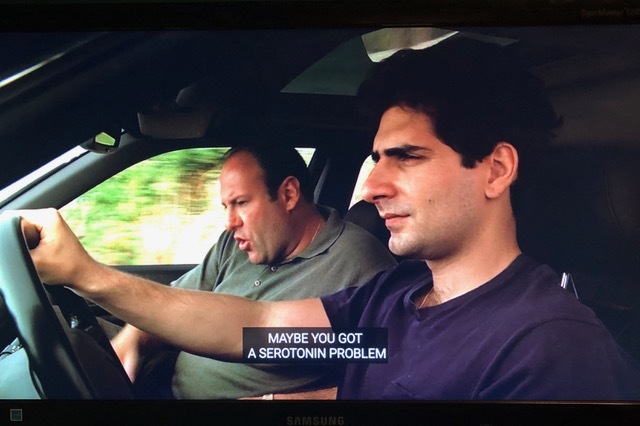 Tony, mob boss on The Sopranos, goes to therapy—takes Prozac. Anne Sexton lights her cave, and Sisyphus, punished, pushes the boulder. Camus imagines. I write this. You maybe read it. 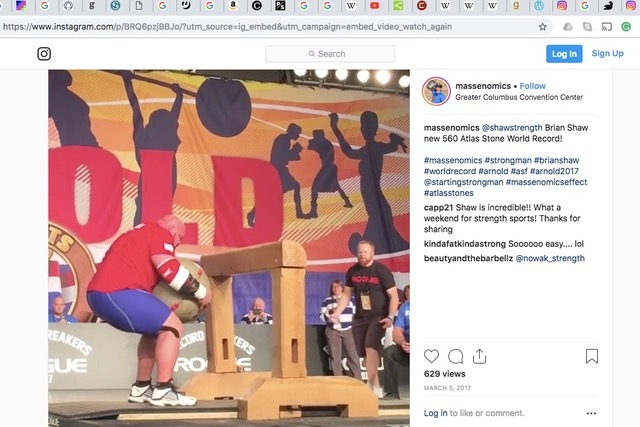 Brian Shaw, my favorite Strongman, sets a world record in the Stone Lift, hoisting up a rock of 560 pounds. From what I can gather, a lot of snacks and some chalk seems to help. Impossibility teaches we might not be the hero in the script of our lives. It is just as well, for there are boulders to push. 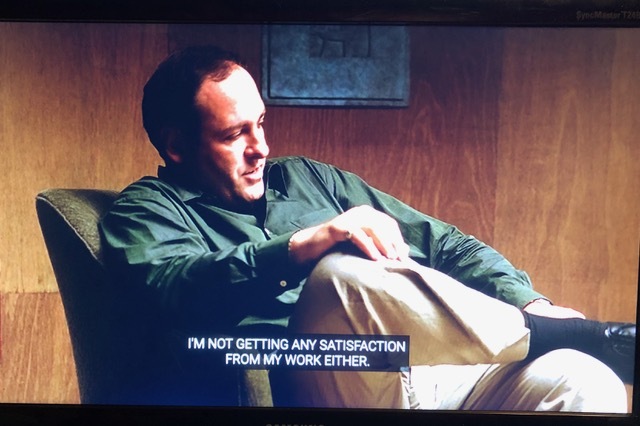 I succumb to playing second fiddle, back up quarterback, supporting actor—all to that great agony of the task at hand, the work to sustain an eternity. Without impossibility we would have nothing to heave against, no way to get traction, no way to stay the course. What we push on pushes back on us and this touching creates the friction of possibility…possibility of what? I am not sure yet. Camus’ guess is happiness and I guess…hope? And I—I will do the same for you.